During the year 1971, Charley Watkins opened the first O’Charley’s restaurant in Nashville, Tennessee and it has grown ever since. This is because they offer casual dining at its best. With a menu full of delicious American fare, this restaurant is sure to please anyone’s taste. In fact, their menu offers everything from fried green tomatoes to prime rib. And just think, each and every meal is freshly seasoned and prepared to perfection. Purchase an O’Charley’s gift card today at a discounted price and you can enjoy more delicious food for less money out of your pocket! Buy a discounted O’Charley’s gift card and stretch your dollar farther on the same fantastic food you love. And because gift cards are a form of currency, you can use your card anytime. Use it this week and save the remaining balance for a rainy day, if you choose while saving money! What’s more, you can use your card at any of their more than 230 locations across North America. Stop in for Sunday brunch or just a night out with the family or friends and save money on your entire bill! Not only does their menu have something for every appetite, but they also offer something for every age. Whether you stop by their inviting bar for a few drinks or you bring the whole family out for dinner, the savings are just as great. Appetizers, main meals, drinks, desserts, children’s menu, and more! Soups, salads, sandwiches, burgers, seafood, pasta- you name it! Enjoy the pleasure of eating in one of America’s favorite casual dining chains for less money! And did you know that you can order your food online for fast pickup? That’s right, and when you use a discounted O’Charley’s gift card to pay for it, you will get more great food for the money! Get your card today and treat your party to a meal they are sure to love. Oh, and don’t forget. They have the absolute best rolls. Steamy, fresh potato rolls for all! Whether you dine in or carry your meal out, you cannot go wrong with a card that saves money on food this delicious! Purchase an O’Charley’s gift card at a fraction of its value and enjoy a night out for less money! What could be better after a long week of work then a night our at o’ Chucks? But saving money doesn’t have to end there! Cards2Cash works to bring you many other discounted cards for lots of popular restaurants! Check out our listings for Max & Erma’s, Ruby Tuesday, TGI Friday’s, Chili’s and more! At Cards2Cash, we understand how difficult it is to save money, and we work to bring you as many ways to save money as we possibly can. Did you know that Cards2Cash buys gift cards? 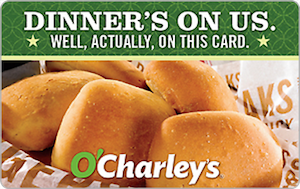 Perhaps you have an O’Charley’s gift card that you are sure you will never use? Then why not sell it to us? We pay top dollar for gift cards to many favorite restaurants, retail stores, and websites! Just think, you can actually put money in your pocket. If interested, stop in one of our retail locations where we will pay you cash for your card. Or simply fill out our secure online form and we’ll get back to you with an offer you are sure to love! Just remember- Cards2Cash is your one-stop gift card shop!